12. Hartmann, Sadakichi. Works 1898?~1915. ‘If one hadn’t been oneself, it wd. have been worth while to have been Sadakichi’—Ezra Pound, Guide to Kulchur, 1938 . 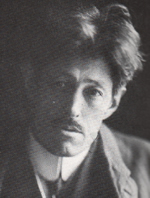 Sadakichi Hartmann in 1914. Image: . 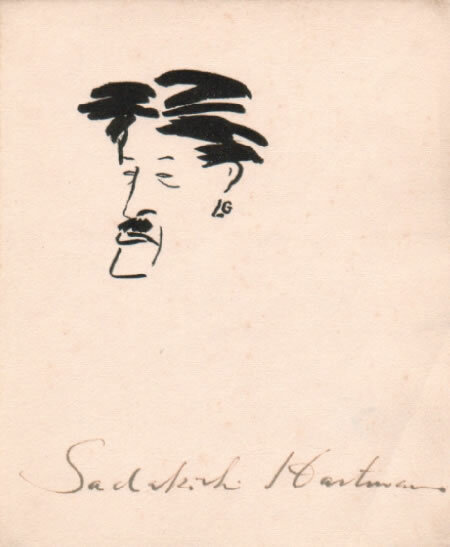 The 1916 ‘Author’s Edition’ of Tanka and Haikai, copy pictured here with self-portrait ink caricature and Hartmann signature, appeared in an edition of 200. 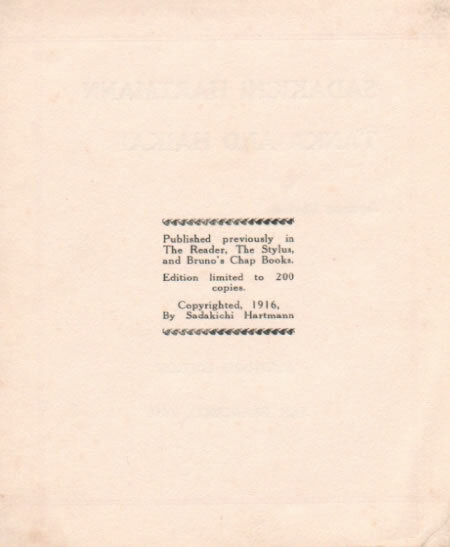 The Lilly Library copy of a less lavishly-produced 1926 edition of 100 bears the inscription, in Hartmann’s hand, ‘To Ezra Pound. Greetings!’. 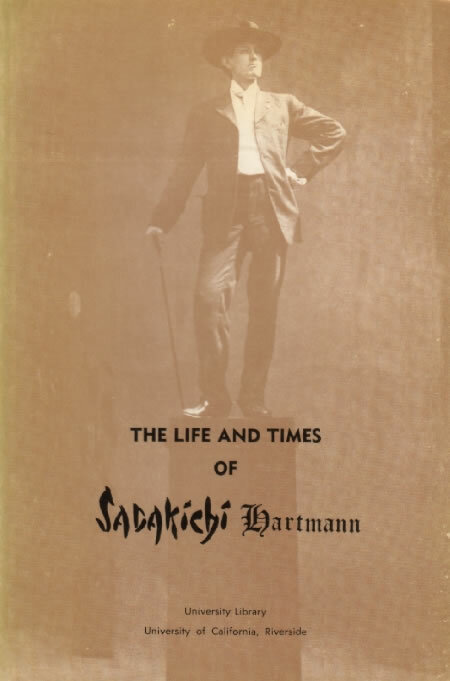 Years before Pound and the Imagists incorporated Japanese models into their verse, Hartmann was defining and helping to shape a Japanese influence both in Western art and English-language poetry, but he has been strangely passed over in previous studies of the subject. Pound himself, at Pisa, counts ‘our friend / Mr Hartmann, / Sadakichi’ among the ‘lost legion’, and laments that ‘the texts of his early stuff are probably lost / with the loss of fly-by-night periodicals’ (BK56e). Sadly, Pound was right. Rexroth without qualification (in A49b) names Hartmann the first to write haiku and tanka in English, beginning the ‘tradition’ that led to Noguchi (see especially 15e7) and Hearn (see especially 9b), and George Knox and Harry Lawton, in introduction to White Chrysanthemums (New York: Herder & Herder, 1971), a collection of Hartmann’s ‘literary fragments and pronouncements’, place Hartmann’s ‘writing [of] haiku and tanka [in English] as early as 1898’. The earliest such work traceable through ordinary channels, however, is from 1915 (see e below), some years after rather than before the similar experiments of those who called themselves Imagists (see especially A3). Still, related work by Hartmann is traceable, and demonstrates that Knox and Lawton understate the case when they write that he ‘may well have had some effect on literary currents after the turn of the century’. 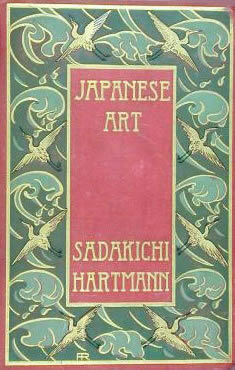 In 1902 and 1903 Hartmann published the first detailed studies of the influence of Japanese art in the West (see a below, and A1); in 1904 his study of Japanese poetics outlined the history and methods of the haiku and tanka, and linked these, eleven years before Flint (in A3), with vers libre (see c); and by June of 1912, sixteen months before Pound met Mary Fenollosa, Hartmann had published an account of the nô (see d) that anticipates in striking ways the language both Pound and Yeats would use in their own later discussions of the form. The question of when Pound met Hartmann, then, is of more than passing interest, but the information is perhaps lost. Rexroth in a foreword to White Chrysanthemums states flatly that Hartmann was the source for many of Pound’s ideas, and by 1938 Pound’s affection for Hartmann was considerable: ‘if one hadn’t been oneself’, he writes in Guide to Kulchur (BK45), ‘it wd. have been worth while to have been Sadakichi’. The earliest record of their friendship traceable in the published record, however, points to an acquaintance already established, in late 1924, in a letter mentioned in passing by Wilhelm (BK188, and see e below). The likelihood is that Pound knew of Hartmann’s considerable reputation early in the century, and that they met in London before 1915, but if the information is ascertainable it will come from archival sources, the most promising of which would be the Pound and Hartmann papers at Riverside (BK90d and CB2). Other than Pound, of poets under study here only Rexroth mentions Hartmann in print. The Rexroth Library at Chiba (CB5) includes White Chrysanthemums, unpublished photographs of Hartmann, and manuscript notes about him in Rexroth’s hand. See also A25 and BK59. a. A History of American Art. 2 vols. Boston: Page, 1902. Scattered through pages 165-275 of vol. 2 are notes that taken together amount to the first extended discussion of the influence of Japanese art, design, and, especially, ‘suggestiveness’ on American and European artists. Includes discussion of Whistler (Ap) and reference to Fenollosa’s collection of Japanese prints at the Boston Museum. Knox and Lawton note that for many years the work was ‘a standard textbook’ for students of American art. b. Japanese Art. Boston: Page, 1903. Reprinted as The Illustrated Guidebook of Japanese Painting. Albuquerque: American Classical College Press, 1978. Hartmann overstates the case somewhat in claiming in the preface that this is ‘the first history of Japanese Art that attempts to popularize the subject’ in the West. Nonetheless, his tracing of the history of the subject from the seventh century to the modern period is more accurate than not, though the value of the work is greater as a historical document than a dependable source, and some of the errors (the preface refers to the ‘glorious epoch of the Fukugawa Shogunate’, for example) surely raised eyebrows even in 1903. A bibliography lists thirty-eight works about Japan in English or French, including Mitford’s Tales (see 4), Chamberlain’s Things Japanese (see 5b), and Hearn’s Glimpses of Unfamiliar Japan (see 9a). Hartmann claimed later that the work was written in seventeen days, but it remained in print for a quarter century. Includes ‘The Influence of Japanese Art on Western Civilization’ (A1). c. ‘The Japanese Conception of Poetry’. Reader Magazine 3 (1904): 185-91. As usual Hartmann is both well ahead of his time and slightly wrong in this work, but in interesting and probably influential ways. He compares Japanese poetry to English and other European verse, and finds that the Japanese forms are ‘really nothing but a primitive application of the vers libre’. Discusses haikai and tanka, and refers as well to other forms, including the nagauta (long poem) of the Manyôshû (Ap). d. ‘Japanese Drama’. Forum 47 (June 1912): 724-34. Of critics who have discussed the question of influence as it relates to this study, only Rexroth, in general terms, posits Hartmann as a direct influence on Pound (see above). No critic has suggested Hartmann as a source for Pound’s work with the nô, never mind Yeats’s, but this work, published before Pound met Mary Fenollosa (Ap), raises compelling questions. Either by accident or intent Hartmann’s language here is echoed both in Pound’s ‘Classical Drama of Japan’ (BK13) and Yeats’s introduction to Certain Noble Plays of Japan (BL11). To take but one example, compare those works with Hartmann’s description of the ‘semi-ritual plays’ that ‘appealed solely to the aristocracy’—the ‘Court of the Shoguns’ and the ‘samurai class’—and were met by the ‘general public’ only with ‘tolerance’, because ‘the ordinary mind failed to comprehend their complicated symbolism’. Hartmann’s study is not without errors of understanding (nô musicians do not ‘improvise’), but in 1912, a year before Stopes’s Plays of Old Japan (see D23), only Fenollosa (10b), Brinkley (14), and Sheiko Tsubouchi (see 17a3) had written more knowledgeably in English of the form. The work describes the nô ‘orchestra’, the use of masks, the ‘association’ of poetry, music, dance, and ‘pantomime’, the ‘lyricism of the highest order’ that ‘would stand comparison with the best efforts of the Provençal poets’, and the kyôgen. Includes discussion of the mugen nô, other Japanese dramatic forms, and the importance of Chikamatsu (Ap). e. Tanka and Haikai: 14 Japanese Rhythms. New York: Bruno, 1915. 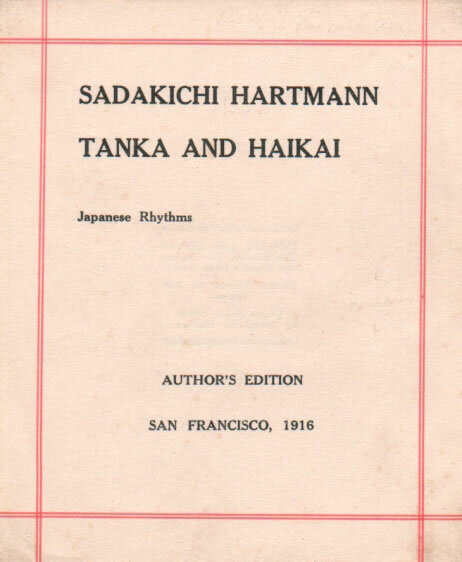 Enlarged ed., Japanese Rhythms: Tanka, Haikai, and Dodoitsu Form, Translated, Adapted, or Imitated by Sadakichi Hartmann. N.p. : n.p., 1926. The first of what was by 1950 dozens and by 2000 thousands of monographs devoted to English-language haiku or tanka. If Rexroth and Knox and Lawton are correct, at least some of these poems were written before the turn of the century, but if earlier versions exist they are in archives or the lost ‘fly-by-night periodicals’ mentioned by Pound (see above). 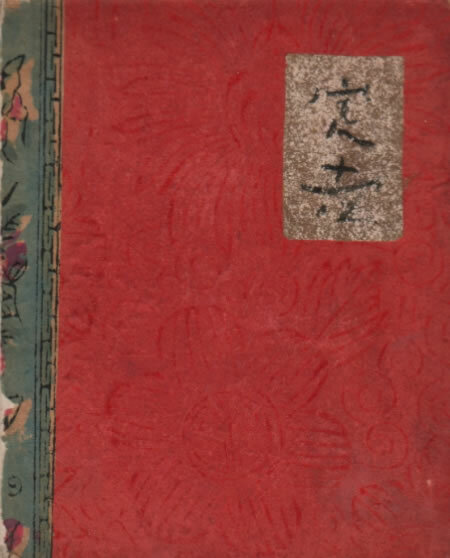 The 1926 edition, limited to 100 copies, consists of mimeographed sheets of Hartmann’s rhymed versions of 11 tanka, 12 ‘haikai’, and 3 ‘dodoitsu’, with brief notes about each form. The copy at the Lilly Library at Indiana University is signed by Hartmann and inscribed in his hand, ‘To Ezra Pound. 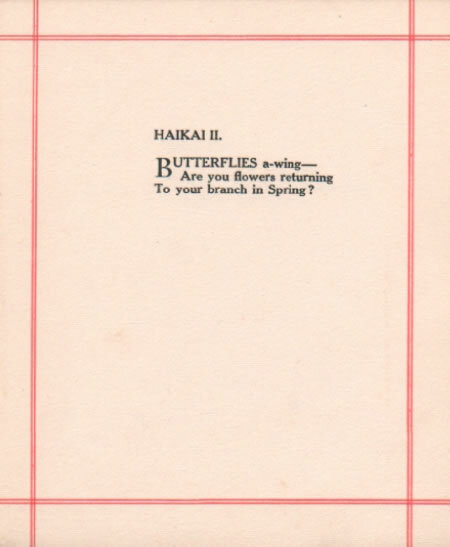 Greetings!’ Among the ‘haikai’ included is ‘Butterflies a-wing / Are you flowers returning / To your branch in spring?’ (see BK12). f. Related materials. 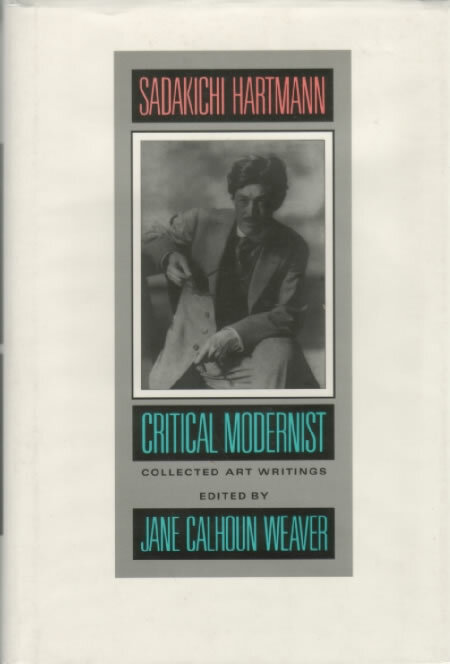 Insofar as Hartmann is remembered at all it is primarily for his art criticism, the focus of Jane Calhoun Weaver’s Sadakichi Hartmann: Critical Modernist (Berkeley: University of California, 1991) and the exhibition catalogue The Life and Times of Sadakichi Hartmann (Riverside: Library of the University of California at Riverside, 1970). 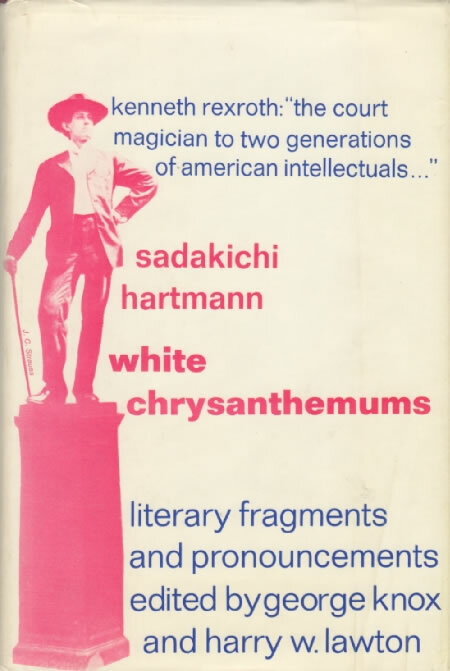 The only works that focus on his relation to modern poetry are Knox and Lawton’s introduction to White Chrysanthemums and Marshall Van Deusen’s ‘Sadakichi Hartmann’, in American Poets, 1880-1945, 3rd ser., pt. 2, Dictionary of Literary Biography 54 (Detroit: Gale, 1987). Knox and Lawton were at work on a book-length biography in the mid 1970s, but it has not appeared.